Richard and Cheryl are proud to be working with The Thacher School to bring you outstanding Horsemanship clinics and events with quality facilities in a pristine setting. 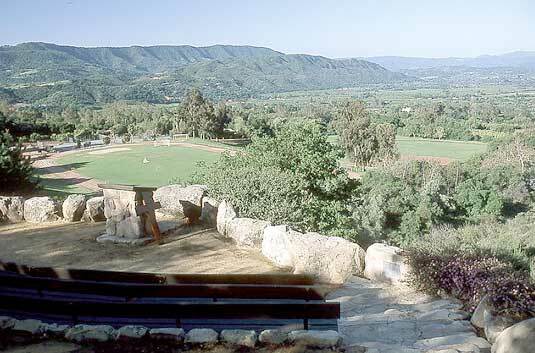 Located in Ojai, California, The Thacher School campus has a “country club” setting with all its amenities. The school’s horse facilities include covered stalls, round pens, a roping arena, a large gymkhana field and jumping arena. Don’t forget the trail riding! The trail head to the Los Padres National Forest is right in our own backyard! You and your horse can ride along trails that will give you some of the most spectacular views California has to offer. The Thacher School is the perfect environment for horses and humans to have fun while developing their horsemanship skills. The Thacher School campus is located just 15 miles east of Ventura, California at the top of the Ojai Valley, nestled against the Los Padres National Forest. The Thacher School is the perfect setting for our annually scheduled Horsemanship events. In order to assure your space, a non-refundable 25% deposit is required for all events. Make your reservations by calling Richard or Cheryl at 805-640-0956. Safe and strong covered pens and stalls will comfortably house your horse during your stay. Hay cubes are provided or you are welcome to bring your own feed. Horses can be provided by special arrangement for a fee of $50 per day. There is an additional fee per night for those bringing an extra horse to any event. All of our summer guests will stay in the school’s dormitories. Each dorm room has two twin beds with centrally located bathrooms and showers available. The Thacher Dining Hall is not the school cafeteria you remember! Bon Appetite, the School’s food service, offers excellent buffet style meals three times daily for your dining enjoyment. Special catered meals are also provided for some scheduled events. Don’t forget to bring your swimsuit. The swimming pool is available at specified times for all of our horsemanship guests.